Stage III Cryogenics. Stage III Ultimate Audio Cable. At True Audiophile. Stage III's AeroStrand™ conductors are made exclusively for Stage III Concepts using an uncommon ultra-slow, temperature-controlled wire extrusion process. This process minimizes the crystal grain boundaries and stresses within the metal caused by out of phase solidification during manufacturing as shown by the magnified cutaway views of extruded silver. Any remaining naturally formed crystals and molecular pattern flaws are eliminated by computer controlled cryogenic treatment, where temperatures of -190 degrees Centigrade (-300F) is maintained for approximately 48 hours. The resulting denser, better aligned atomic structure of the metal actually improves conductivity and makes the wire's inner composition completely homogenous and non-directional. 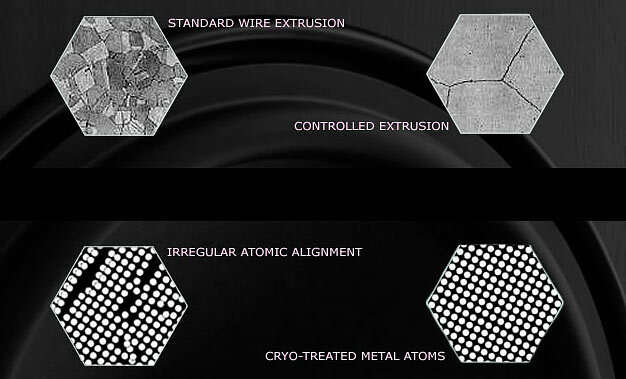 All Stage III connectors and terminations undergo the same cryogenic tempering process as well.